Pınar Su, who introduced packaged bottled natural spring water to Turkish consumers via its facility founded in 1984, is pioneering the sector as a leading company with high standards in all business processes. Pınar Su, having a hygienic environment far above sector standards, is performing physical, chemical and microbiological tests on the water in each phase of production from the spring to filling phase to have it ready for consumption. As of 2016 year end, Pınar Su is continuing its works being the only company with a 100 % Turkish capital among big companies in water sector, who make sales at the national level. Pınar Su, who focused on increasing market share with new product development works, is continuing its works with developing customer satisfaction and sustainable growth goals. Turkey's first packaged water was introduced to consumers with the Pınar Şaşal brand. PVC packaging was used for the first time. First export to Germany was performed. 90 % of Turkey’s total water export was performed by Pınar Su. Annual bottled water amount approached to 100.000 tons. Pınar Madran was presented in plastic bottle for the first time and this initiative was rewarded with Golden Plaque by Turkish Standards Institution. ISO 9002 Quality Management System Certificate was obtained. 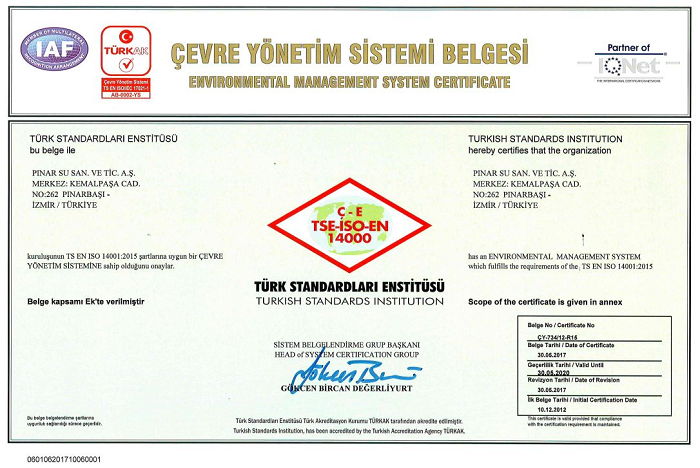 TSE ISO 14001 Environment Management System Certificate was obtained. Carboy Pınar Madran Water was introduced to the market. Marmara Su was founded by purchasing Sakarya and Isparta springs. Pınar Yaşam Pınarım and Pınar Denge branded products were offered to consumers from these two new springs. 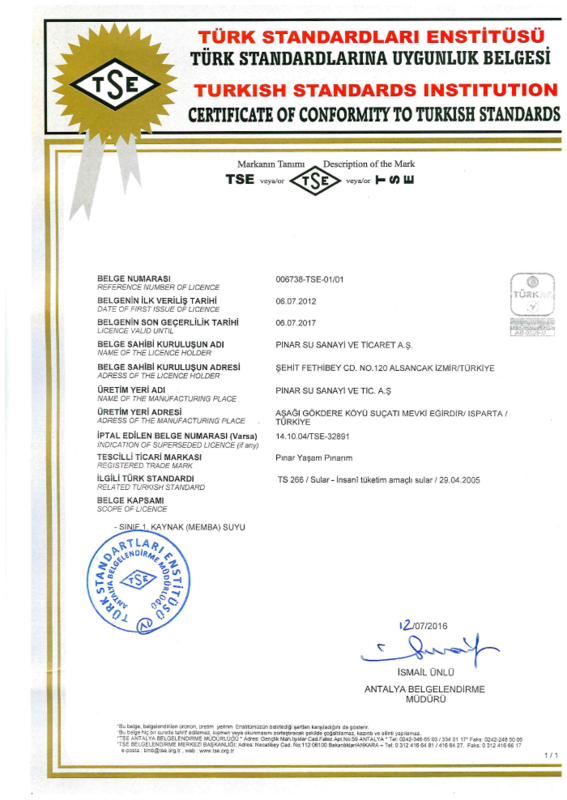 • TS ISO 9001:2000 Certificate was obtained. 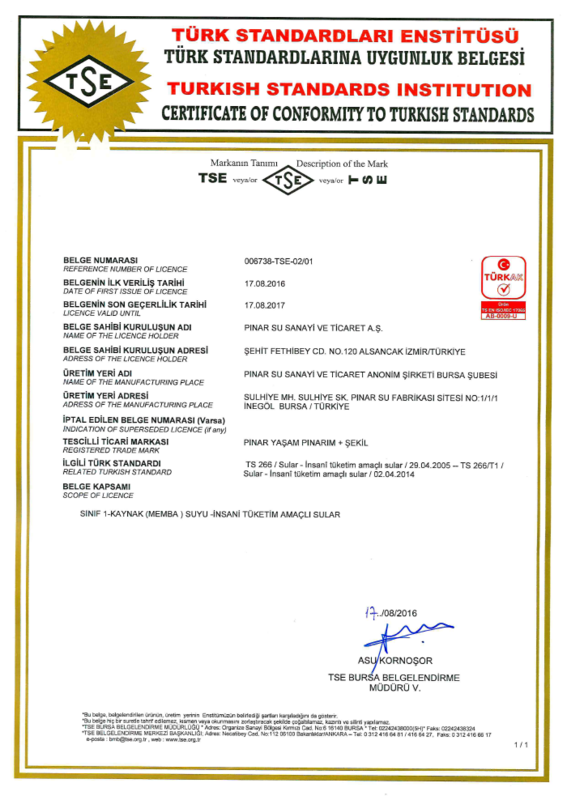 TS 13001 HACCP Food Safety System Certificate was obtained. Pınar Madran facility, which was built on an indoor area of 14.000 m2 within a total area of 64.000 m2 in Aydın-Bozdoğan, has reached 17.000 m2 indoor area with additional investments. 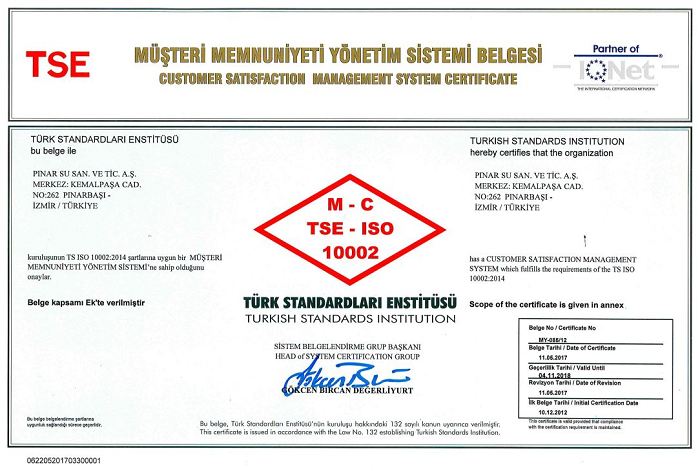 Pınar Madran became the first Turkish beverage to obtain NSF International Quality Certificate. TS ISO EN 9001:2008 Quality Management System Certificate was obtained. 444 99 00 Pınar Su Order Line was implemented and generalized across Turkey. 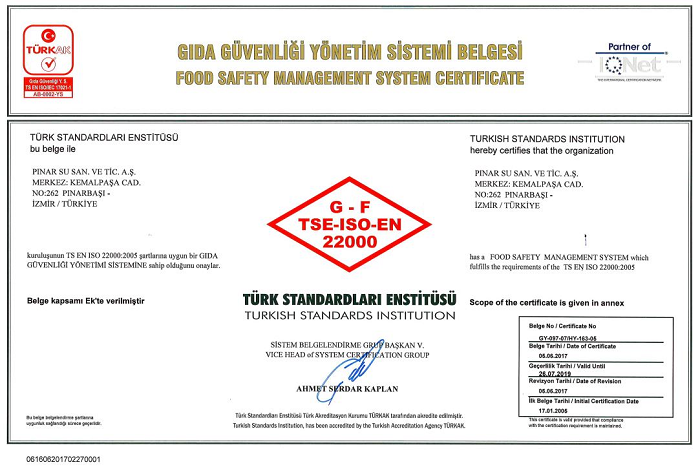 TS ISO EN 22000 Food Safety Management System Certificate was obtained. With the short-neck project weight in grams of bottles were reduced. Glass bottle design was renewed. In Isparta spring change has been made from Toros to Akçaağaç. 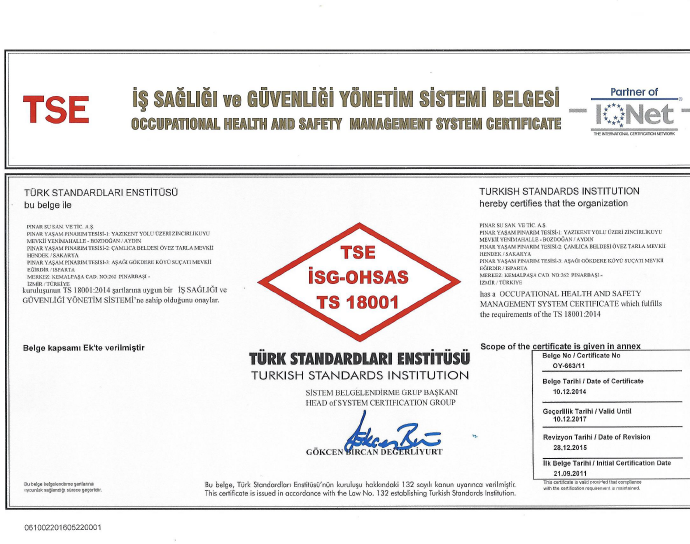 TS 18001 Occupational Health and Safety Management System Certificate was obtained. TS ISO 10002 Customer Satisfaction Management System Certificate was obtained. 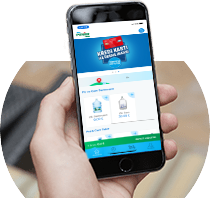 For the first time in Turkey online carboy water order system via internet was implemented. 5L glass carboy was introduced to the market. Pınar Su order application available on Android and iOS was launched. Best product awards were given by BrandSpark International to 5L glass carboy on household water category and to glass bottles with season concepts on individual water category. 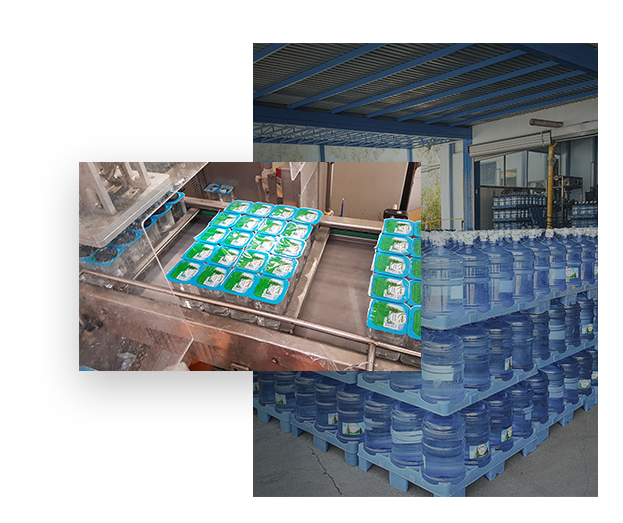 In Hendek and Isparta plastic bottle production capacity was increased up to 100 %. With plain, fruit-flavored and fruit-flavored with vitamins products penetration into Sparkling Water category was accomplished. 0,33L and 0,75L glass bottles were introduced to the market with new designs. BRC (British Retail Consortium) Food Safety Certificate was obtained. According to Turkish National Customer Satisfaction Index (TMME) 2014 2. Quarter results, Pınar Su won the first place in packaged water sector gaining 82 points out of 100. 0,33L and 0,75L glass bottles were introduced to the market with new premium designs. Pınar Su became the official water supplier of Turkish Basketball Federation and National Basketball teams. 15L glass carboy was launched. ● Mobile order application was updated. Uludağ spring investment was finalized and implemented in Bursa / İnegöl. With the launch of Pınar Frii, sparkling water category was extended. Pınar Lemonade was introduced to the market. Licensed Minions bottles attended the product portfolio. Besides filling spring water, the ability to produce both carbonated and carbonated-free fruit beverages was gained. Water, one of the biggest necessities for a sustainable healthy life, is presented to the consumers with Pınar quality and assurance by being bottled with its purest and most natural form. Pınar Su, who use the world's latest technologies in all filling facilities and constantly follow technological developments in the sector, is performing filling operations untouched by humans in a fully hygienic environment positively pressured by sterile air, where outside air intake is blocked and the air is continuously being cleaned. Pınar Su, with the laboratory facilities possessed, performs physical, chemical and microbiological tests on the water in each phase of production from the spring to filling phase. Uludağ Facilities', as being one of the fastest lines in Turkey, spring has a soft taste characteristic. In Uludağ Facilities efficiency is focused on, by making the most of technological opportunities in loading and packaging systems. Although line investments have not been finalized in our Bursa facility, current capacity has reached the level of 620000 tons per year. Having been placed 1000 meters above locations, Pınar Madran spring is one of the top-quality springs in Turkey in terms of essence and taste. Annual filling capacity of the facility, which renewed its infrastructure technologically, is 550000 tons. Gökçeağaç spring and facilities are located at the foothills of Keremali mountain in Sakarya Hendek. It has a total annual filling capacity of 480000 tons. Pınar Su Akçaağaç Facility is filling up natural spring water within the borders of Aşağı Gökdere Village in Isparta/Eğirdir. It has a total annual filling capacity of 210000 tons. Pınar Su, being the only national company operating in Turkey with a 100 % Turkish capital, performed new facility building and innovation activities as well as new product launchings with the purpose of developing production capacity. Pınar Su had an increase in revenue by 13.5 % and in sales on a tonnage basis by 4.2 % in 2016. Pınar Su with sectorial know-how, high brand reliability and customer satisfaction, provides product diversity with different packages and volumes and in accordance with the needs of consumers in Uludağ, Madran, Gökçeağaç and Akçaağaç natural water springs. Also offers lemonade, plain and fruit-flavored sparkling water product portfolio to the consumer. Pınar Su, which aims to leave a healthier physical and social environment to next generations for a livable world and quality living, carries out a work in accordance with United Nations Global Compact (UNGC) that Yaşar Holding signed in 2007. As Yaşar Holding identifies five priority areas; "Energy and Climate Change", "Water Utilization and Waste Water", "Used Materials and Waste", "Health and Safety", "Social Contribution" within the scope of sustainability approach, Pınar Su reveals its sustainability approach and priorities regarding environment, too. Pınar Su, who conducts business focused on effective and efficient management of limited natural resources, continued its work on preserving the environment, prevention of environmental pollution, controlling utilization of natural resources and waste disposal in 2016. 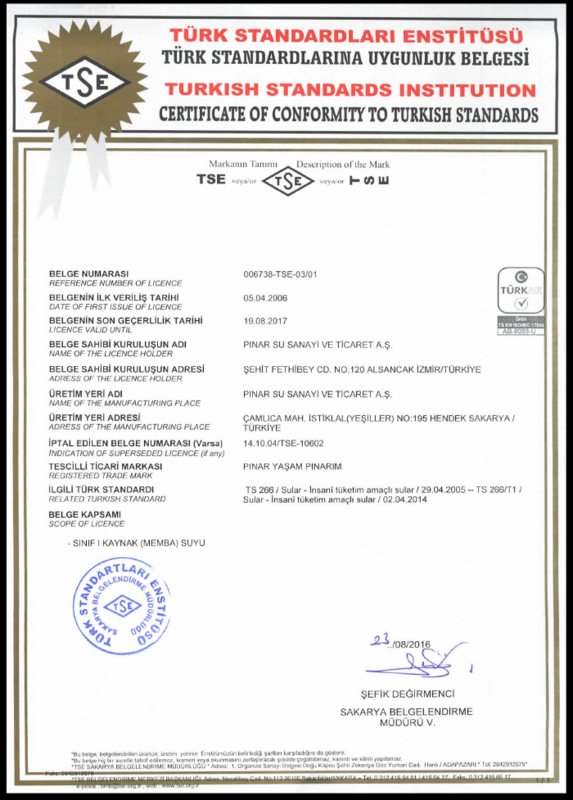 Pınar became the first Turkish water company to obtain TSE Certificate. 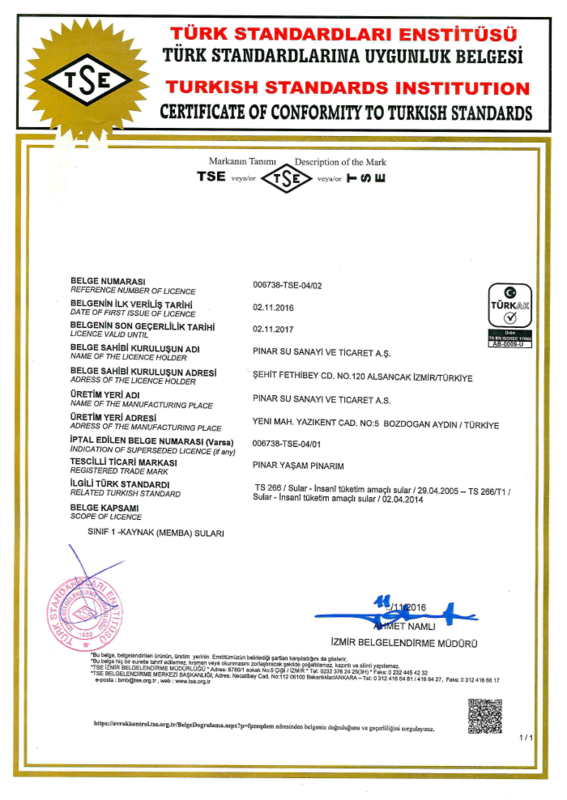 Pınar Su, who via the certificates obtained proves that emphasis is placed on food safety, cleanliness and hygiene-health standards, quality and environmental conscience, is Turkey's first TSE certified packaged water brand and is the first Turkish beverage to register its quality by obtaining competence certificate from American National Sanitation Board (NSF). Pınar Su, who continue production in its facilities with an efficient infrastructure and modern technology, is performing filling operations untouched by humans via “Clean Room” technology and Class 100 Isolator which includes a fully hygienic environment positively pressured by sterile air, where outside air intake is blocked and the air is continuously being cleaned. Pınar Su, who with the vast laboratory facilities possessed, performs physical, chemical and microbiological tests on the water in each phase of production from the spring to filling phase, applies quality systems preferred worldwide on this topic and international standards. Pınar Su, who act as integrated with the organizations that are collaborated during production activities, take it as a principle to check over and develop their performances continuously. In this regard, suppliers are evaluated within the scope of ISO 9000 Quality System Certificate. Pınar Su, who with this application contribute to management structures of suppliers from a corporate perspective, by grading its suppliers on a monthly basis in terms of price, quality and delivery, performs improvement works for the ones who can't obtain a good enough result. Pınar Su who procure all packaging materials, especially plastic preform, from expert manufacturers, is increasing the number of active suppliers systematically. Pınar Su, while determining its suppliers, prefers organizations who match with its own corporate values and fulfill their responsibilities against public health and nature. Today Pınar Su, as Turkey's one of the most powerful brands and with the active role taken in foreign trade, has been exporting to 27 countries including Germany, England, Holland, France, Belgium, Kosovo, Kuwait, Qatar, Saudi Arabia, UAE, Singapore, Australia and USA and is increasing the number of countries every passing year. Pınar Su is producing customized labelled products in accordance with languages and regulations of the countries in its facility and sending those products by sea and land to offer consumers all around the world. Pınar Su, being the first European Union approved Turkish water brand and registering its quality by obtaining NSF certificate, is performing a considerable amount of Turkish export with wide range of product. Pınar Su, who is established with the mission of "Increasing export volume of our country by developing powerful global brands, strengthening 'Made in Turkey' image and Turkey's reputation via the developed Turkish brands", is the first water company to be accepted by Turquality that is the first and only state-sponsored branding program.